All the wrestlers on the show have a profile on the website, you can click on their name to go straight to it. Since we are watching this on DVD, all matches are shown in full. This is a classic gaijin vs. native match, the story here will be can the underdog crowd favorite overcome the odds and beat the more experienced wrestler double her size. The most recent results I could find with Lylah are from 2015 so she may be retired, she mostly wrestled in smaller promotions in the Midwest but did have a handful of matches in Diana around this time period. Rabbit Miyu is an itty bitty wrestler who at the time wrestled in JWP but is now retired. Lylah trash talks Miyu so Miyu pushes her, but Lylah pushes Miyu down in the corner. Miyu avoids Lylah and dropkicks her in the knee, another dropkick by Miyu but Lylah blocks the scoop slam. Lylah hits a slam of her own, another one by Lylah and she covers Miyu for two. Miyu bridges out of the pin and boots Lylah repeatedly in the head, she applies a waistlock but Lylah turns out of it. Elbows by Miyu and she hits a DDT, running boot by Miyu and she goes up top, hitting a missile dropkick. She goes up top again and goes for another one, but Lylah absorbs the blow. Miyu goes off the ropes but Lylah hits a hard shoulderblock, another one by Lylah and she covers Miyu for a two count. Leg drop by Lylah and she hits a running hip attack in the corner, she hits a second one but Miyu gets out of the corner and they trade elbows. Scoop slam by Lylah and she connects with the running senton, bur Miyu kicks out of the cover. Lylah picks up Miyu and drops her with a running powerslam, she goes up top to the second turnbuckle and nails the diving senton for the three count! Lylah Lodge is the winner. So I wasn’t completely right about the match layout. They did do a lot of big vs. little spots but Miyu had a lot of offense in this match, it was just about 50/50. I was expecting her just to get a few hope spots but then lose in convincing fashion. Too short to be offensive but nothing memorable to kick off the show. While Eiger’s matches can be a bit predictable, I’m really looking forward to seeing some Crazy Mary Dobson. Dobson is better known today as Sarah Logan in WWE, where she wrestles on the Smackdown brand. Back in 2014 however she was just a young wrestler trying to find her place in wrestling, at this point in her career she hadn’t won any titles yet. Eiger is Mizuki Endo as a ghost zombie character, mostly for comedy but she has some wrestling skills also which she shows off when needed. Eiger starts fast as she tries to catch Mary, but Mary generally is able to avoid all her charges. Eiger gets her back however, Mary spins around but Eiger screams and scares Mary out of the ring to the floor. Eiger goes out after her and plays with the crowd, they return to the ring but Mary has her Jason Mask and uses it to scare Eiger. She gets a staple gun but Eiger takes it from her, but the referee gets it before she gets to use it. Mary grabs Eiger from behind and hits a release German, Irish whip by Mary and she elbows Eiger in the chest. Eiger gets back in control and twists on Mary’s hair, Irish whip by Eiger but Mary flips herself out to the apron and hits a diving crossbody from the top for two. Knee by Mary, she argues with the referee for a bit which gives Eiger time to recover. Kneedrop by Eiger, she waits for Mary to get up but Mary kicks her in the head when she charges in. Eiger rolls out of the ring but Mary goes out after her and throws her into the ring post. Back in the ring, Eiger headbutts Mary and goes up top, but Mary uppercuts her before she can jump off. Eiger starts acting freaky so Mary gets her mask and staple gun to even the odds. Eiger kicks the referee and throws him out of the ring, she spits dust at Mary and kicks her down in the corner. She gets the staple gun and staples Mary’s face, Mary bails out of the ring but Eiger follows her out and throws her around in the crowd. They finally return to the ring, Eiger gets Mary by the throat and hits a chokeslam, but Mary kicks out of the cover. Eiger gets on the second turnbuckle but Mary elbows her and joins her, hitting a Frankensteiner. Mary grabs Eiger and hits a headbutt, powerslam by Mary and she goes for a moonsault, but Eiger moves out of the way. Eiger grabs Mary but Mary applies a schoolboy for the three count! Crazy Mary Dobson wins! This match is a bit of a hodge podge random assortment. Arisa Nakajima at the time was the ace of JWP, now she is a member of SEAdLINNNG. Yuiga was (and is) a Freelancer that rarely wrestles, while Hamuko Hoshi represents Ice Ribbon. On the other team, Cherry is a popular DDT wrestler while Raideen wrestles in JWP. Jessica James I am not sure is still active, she did wrestle last summer in a dark match during the Mae Young Classic but otherwise match results for her are scarce. Raideen and Yuiga start off, hard shoulderblock by Hamuko and she tags in Jessica. Jessica and Raideen trade holds until they end up on the mat, Raideen tags in Arisa and they double team Jessica in the corner. Dropkick by Arisa and she hits a side slam before covering lll for a two count. Arisa tags in Hamuko, belly bump by Hamuko to Jessica and she puts Jessica in a crab hold. Jessica gets to the ropes for the break, Hamuko tags in Yuiga and she suplexes Jessica. Jessica gets triple teamed in the ropes, kicks by Yuiga and she knees Jessica in the face. Hamuko returns but Jessica hits her with a hurricanrana and dropkick, giving her time to tag in Raideen. Hard shoulderblocks by Raideen to everyone, she picks up Hamuko and puts her in a backbreaker. Raideen goes up top but Arisa grabs her from the apron, giving Hamuko time to recover and toss Raideen to the mat. Hamuko pushes Raideen to the mat and nails a running belly bump, but Raideen kicks out of the cover. Hamuko tags in Arisa, kicks to the face by Arisa but Arisa gets a chair and kicks it into Raideen. Hamuko and Yuiga both come in and help Arisa dropkick a chair into Raideen’s head, cover by Arisa but it gets a two count. Raideen drives Arisa back into the corner and hits a series of lariats, cover by Raideen but it gets two. Raideen tags in Cherry, lariat by Cherry and she hits a double wrist clutch armsault for a two count. Arisa elbows Cherry back and hits a release German, Cutie Special by Arisa and she makes the tag to Hamuko. Hamuko gets Cherry up but Cherry wiggles away, palm strikes by Hamuko and she hits a body avalanche. Cutter by Hamuko, and she covers Cherry for two. Hamuko goes up top but Cherry avoids her diving body press, cradle by Cherry but the cover is broken up. Back chop by Cherry but Hamuko roars back with a lariat, and she makes the tag to Yuiga while Jessica is tagged in as well. Jessica dropkicks Yuiga in the knee and hits a hurricanrana, kick to the head by Jessica and she covers Yuiga for two. Yuiga kicks Jessica in the head and hits a cyclone suplex, Hamuko comes in and she hits a lariat onto Jessica. Big boot by Arisa, Yuiga grabs Jessica and she delivers a German suplex hold for two. Raideen and Cherry end up in the ring with everyone else, moonsault by Raideen to Yuiga and Cherry nails the Cherry Bomb. Jessica then goes up top and hits a moonsault, cover by Jessica and she gets the three count! Cherry, Jessica James, and Raideen Hagane are the winners. This is one of those matches that its hard to even have a strong opinion on. It was a perfectly fine and watchable midcard match, everyone got a bit of a chance to shine and everyone looked good, aside from a few small miscues from Jessica James. A good shortish tag match but nothing too special. Dump! Any match with Dump Matsumoto I am probably going to love my default, as she is one of the most legendary heels in Joshi history. Her partner Keiko is a regular in Diana, she is a long time respected veteran. On the other team, Megumi has mostly wrestled in small promotions during her career as a Freelancer, while KAZUKI is a long time fixture of JWP. At their ages and/or skill levels, this won’t be a workrate match but it should still be fun anyway. Dump and Megumi kick things off, Dump bumps Megumi to the mat and the action spills out onto the floor with Team Dump dominating. They return into the ring after a moment, Megumi tries to elbow Dump but Dump elbows her back and flings Megumi by the hair. Keiko returns just to give Dump assistance that she didn’t need, Keiko stays in as legal and gets a chain, choking Megumi with it. Dump comes in with a kendo stick to jab Megumi with it, KAZUKI things of coming in to help but Dump hits her with the stick to knock her back to the floor. Scoop slam by Keiko to Megumi and she chokes her, Irish whip by Dump and she lariats Megumi for a two count. Dump returns, Megumi avoids her kendo stick accounts and she applies a hanging armbar over the top rope. Megumi goes up top but Dump avoids her dive, German suplex by Dump and she covers Megumi for two. Dump tags in Keiko, but Megumi cradles her and hits a double knee off the ropes. That gives her time to tag in KAZUKI, she tags in too as they double team Keiko. KAZUKI putts Keiko in the corner and hits a reverse double knee, cover by KAZUKI but Dump hits her with the kendo stick. Keiko comes back with a face crusher and tags in Dump, who never left the ring in the first place, so Keiko keeps kicking KAZUKI. Keiko covers KAZUKI even though Dump is still standing there, KAZUKI tags Megumi and Megumi hits a hip toss onto Keiko. Megumi slams Keiko near the corner, she charges Dump but Dump moves and Megumi falls out of the ring. They end up on the floor again as Dump tosses Megumi onto a table and into some chairs, Keiko and Megumi return to the ring and Keiko hits a tornado DDT. Kick to the head by Keiko but Megumi catches her next kick attempt, Dump comes in and hits her with a kendo stick however and Keiko kicks Megumi in the chest. Heel drop by Keiko but Megumi puts her in a cross armbreaker, that gets broken up pretty quickly as Dump mostly roams the ring hitting random people with kendo sticks. Megumi gets away and tags KAZUKI, cutter by KAZUKI to Keiko but the referee is too busy with Dump to make the count. KAZUKI picks up Keiko again and hits a backdrop suplex, diving body press by Megumi and KAZUKI follows up with a diving kneedrop for two. Megumi and KAZUKI go to Dump and try to suplex her but she blocks it and hits a double lariat. Shining Wizard by Keiko to KAZUKI, but Megumi breaks up her cover. Dump starts whacking people with the kendo stick again, high kick by Keiko to KAZUKI and she delivers the Falcon Arrow for the three count! Dump Matsumoto and Keiko Aono win! Now here is a fun collection of wrestlers. All six names should be recognizable to any serious Joshi fan, as all still are wrestling and most have a higher status now than they did in 2014. Meiko is the leader of Sendai Girls’, while at the time of the match Kagetsu was in Sendai Girls’ as well. Kaho Kobayashi was only a year into her career at the time and mostly wrestled in Pro Wrestling WAVE. Kaoru Ito and Sareee both were (and still are) affiliated with Diana, while Bolshoi hailed from JWP (now she is in PURE-J). All six are good to great wrestlers, and since the match got enough time I’m expecting this to be pretty entertaining. Sareee and Bolshoi start, but Kaho quickly runs in to help along with Kagetsu and they triple team Bolshoi in the corner. Ito and Meiko even the odds as the veterans stack their opponents in the corner and Ito hits a running body avalanche. Bolshoi grabs Sareee’s wrist and she walks the ropes, armdrag by Bolshoi and she chokes Sareee with her boot. Meiko comes in and Sareee eats a double shoulderblock, cover by Bolshoi but Sareee bridges out of it and tags in Kaho. Bolshoi elbows Kaho in the head and tags in Ito, Ito lariats Kaho in the corner and she puts Kaho in a crab hold. Camel clutch by Ito but Kaho avoids her charge in the corner and she hits a series of dropkicks. Elbows by Kaho but Ito doesn’t go down, Kaho finally dropkicks Ito to the mat and she covers Ito for two. Lariat by Ito and she tags in Bolshoi, Bolshoi picks up Kaho and she kicks her to the mat. Kagetsu grabs Bolshoi from the apron to help, elbows by Kaho and she dropkicks Bolshoi. Sareee runs in and dropkicks Bolshoi, sunset flip by Kaho to Bolshoi and she tags in Kagetsu. Bolshoi grabs Kagetsu to the ground and puts her in an armbar, but Kagetsu muscles out of it and spins around Bolshoi in an airplane spin. Running elbows by Kagetsu in the corner but Bolshoi hits a palm strike, Tiger Feint Kick by Bolshoi and she hits a running palm strike for a two count. Meiko comes in and kicks Kagetsu in the chest, Sareee and Kaho both come in and dropkick Meiko but Meiko fights them all off, kick to the head by Meiko to Kagetsu and she slams Sareee on top of Kagetsu. Bolshoi then hits a footstomp on the pair, Meiko stacks Kaho on top of both Kagetsu and Sareee and Ito follows with a running footstomp of her own. Meiko knees Kagetsu and hits a suplex, cover by Meiko but it gets two. Meiko goes up top but Kagetsu quickly joins her and hits a superplex. Kagetsu tags in Sareee, dropkicks by Sareee to Meiko and she cradles Meiko for a two count. Sareee goes off the ropes but Meiko kicks her in the head, cartwheel kneedrop by Meiko and she tags in Ito. Footstomp and a senton by Ito, she picks up Sareee and drops her with a uranage. Kaho and Kagetsu run in and dropkick Ito, but Ito lariats both of them. Everyone but Ito goes outside the ring, emphatic baseball slide by Ito to her opponents and Sareee is slid back into the ring. Bolshoi and Meiko get in the ring too but they are tripped from the floor by Kaho and Kagetsu, the young rising stars team all hit dropkicks and go up top, with both Kaho and Kagetsu hitting missile dropkicks. Sareee follows with a missile dropkick onto Ito, then she and Kaho go to opposite corners while Kagetsu goes on the apron and all three hit simultaneous missile dropkicks onto Ito. Sareee picks up Ito but Ito blocks the suplex attempt, she tries again but still can’t get her over. Ito drives Sareee back into the corner Kaho comes off the top with a diving Somato. Swandive missile dropkick by Kagetsu and Sareee finally gets Ito over with the German suplex, but Bolshoi breaks up the cover. Sareee picks up Ito and tries again but Bolshoi grabs her from behind, Meiko kicks Sareee in the head and Bolshoi delivers her own German suplex. Sit-down powerbomb by Ito to Sareee, but the cover gets broken up. Ito quickly picks up Sareee and hits a spinning sit-down powerbomb this time, but again her cover is broken up by Sareee’s friends. Meiko and Bolshoi come in and drop Kagetsu and Kaho with suplexes so they’ll stop interfering, Ito picks up Sareee but this time Sareee blocks the powerbomb attempt. Sareee spins down Ito’s back and rolls her up with a cradle, but Ito barely kicks out. Back up, hard lariat by Ito and she goes up top, palm strike by Bolshoi to Sareee and Meiko kicks Sareee in the chest. Diving footstomp by Ito to Sareee, and she covers her for the three count! Kaoru Ito, Command Bolshoi, and Meiko Satomura are the winners! One of the themes of Diana events is they use a lot of ‘legend’ wrestlers as the bulk of their roster is from the heyday of Joshi. Jaguar Yokota and Takako Inoue are both regulars in Diana and need no introduction as they are two of the most well-known Joshi wrestlers ever. Manami Toyota, who retired last November, is considered by many as the best Joshi wrestler in history (with Jaguar Yokota on that list as well), and fits right in with the product that Diana presents. Mima Shimoda is best known as one half of LCO with Etsuko Mita (one of the top tag teams in Joshi history), she is mostly retired but still wrestles in Diana as well. Quite a group, and while all are no longer in their primes they still wrestle with the same passion they always did. Shimoda and Yokota begin the match for their teams, hard shoulderblock by Shimoda but Yokota armdrags Shimoda out of the ring and hits a cannonball off the apron. Yokota returns with Shimoda slowly following as well, Inoue comes in to help and they both lariat Yokota. Shimoda officially tags in Inoue, Inoue works Yokota’s arm but Yokota puts her in a wristlock and tags in Toyota. Armdrag by Toyota, Yokota comes in and headbutts Inoue while Toyota puts Inoue in a leg lock. Toyota applies the Muta Lock on Inoue but Inoue gets into the ropes for the break, Toyota steps on Inoue’s hand in return but Inoue knocks Toyota to the mat and tags in Shimoda. Shimoda bounces Toyota off the ropes and boots her, jumping neck drop by Shimoda and she covers Toyota for two. Bodyscissors by Shimoda but Toyota gets out of it and goes up top, hitting a missile dropkick for a two count. Toyota tags in Yokota and Yokota puts Shimoda into an Octopus Hold, cradle by Yokota and she puts Shimoda in a figure four leglock. Toyota comes off the top with a body press while Shimoda is still in the hold, but Shimoda eventually makes it to the ropes. Yokota jumps down on Shimoda’s leg before tagging in Toyota, Shimoda boots Toyota back and makes the hot tag to Inoue. Inoue boots Toyota repeatedly in the head, DDT by Inoue and she puts Toyota in a STF. Toyota crawls to the ropes to force the break, Inoue Irish whips Toyota but Toyota reverses it and rolls up Inoue for two. Toyota tags in Yokota, Yokota kicks back Inoue but Inoue hits a backdrop suplex hold. Yokota tackles Inoue and kicks her in the leg, piledriver by Yokota and she covers Inoue, but Inoue barely kicks out. Yokota picks up Inoue and puts her in the Cobra Twist, Irish whip by Yokota but Inoue hits an armdrag. Shimoda comes in but Yokota hits a headlock/headscissors takedown on both of them, double DDT by Yokota and she hits a somersault legdrop onto both of them. Inoue boots Yokota back and hits a double underhook suplex, but Yokota hits a dragon screw leg whip and tags Toyota. Toyota picks up Inoue but Inoue hits a boot and a DDT. Toyota gets back up and applies the rolling cradle for two. Toyota goes up top but Inoue avoids the moonsault, she then goes up top but Toyota smacks her and joins her on the turnbuckle. Inoue chokeslams Toyota to the mat, she goes up top but Toyota avoids the Takako Panic. Spinning backfist by Inoue followed by a head kick, but Toyota barely kicks out of the cover. Inoue tags in Shimoda, she picks up Toyota and she hits a jumping neck drop. Shimoda goes up top but Toyota joins her, Shimoda pushes Toyota back down however and delivers the missile dropkick. Boot by Toyota and she gets Shimoda on her shoulders, Shimoda wiggles away but Toyota hits a German suplex. Toyota goes up top and nails the moonsault, but Shimoda kicks out. Yokota gets on the second turnbuckle before she is tagged in, hitting a somersault legdrop for two. Toyota boots Shimoda, fisherman buster by Yokota and she covers Shimoda for a two count. Yokota picks up Shimoda, Shimoda slides away and she cradles for two. Inoue runs in and boots Yokota, Toyota takes care of her but Shimoda hits a German suplex onto Toyota. Tiger suplex hold by Shimoda to Yokota, she drags her up but Toyota boots Shimoda again. Yokota and Shimoda trade flash pins, until Yokota holds down Shimoda long enough for the three count! Jaguar Yokota and Manami Toyota win! And we have finally reached the moment we have all been waiting for! They showed a recap before the match started to show the buildup, but these teams have been battling in some form as far back as 2012, leading to this match. Inoue and Watanabe won the tag team titles from Yumiko Hotta (and Keiko Aono) in late 2013 but Mask de Sun (Kyoko Kimura) won the singles championship from Kyoko Inoue just two weeks later, so beyond just being a blood feud they had feuded for Diana’s titles as well. 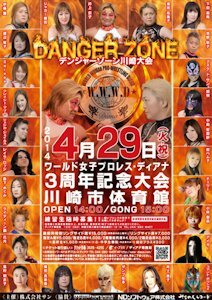 Inoue, Watanabe, and Hotta are no strangers to cage matches, as they were all in several back in their AJW days, and Mask de Sun has had her share of violent matches as well. The match is under typical Joshi cage rules, meaning in order to win both members of the team must climb over the top of the cage and hit the floor. If they return for some reason (which happens), they then must re-exit the cage again to count as escaped. There are no tag rules of course since they are in a cage, and there are other weapons in the ring including a table and a ladder. 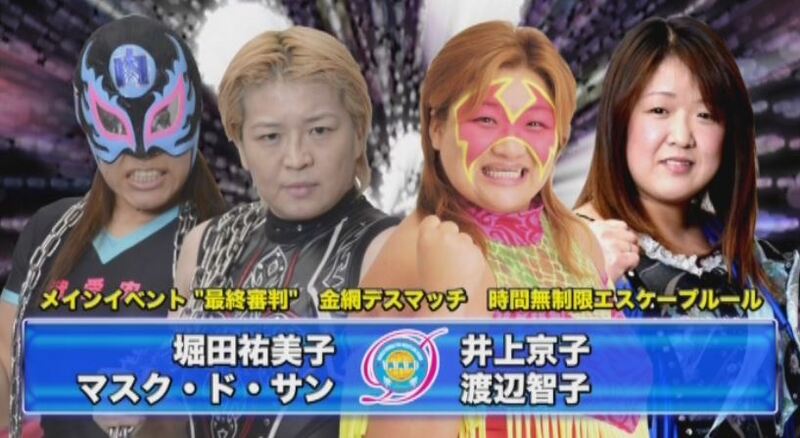 I am going to buck my usual tradition of referring to wrestlers by their name in the match and refer to Mask de Sun going forward as Kyoko Kimura, because it is easier to type and will probably be easier to read. Since this match will be pure chaos the play by play will be less precise than usual, I’m just going to make sure I hit the big stuff. Inoue and Watanabe get the first advantage in the match and quickly try to escape the cage, but they get grabbed before they can successfully make it out. Kimura gets a chain and starts beating Watanabe with it, busting her open in the process. So we get our first blood approximately 30 seconds into the match. Hotta gets a board and whacks both opponents with it, Kimura and Hotta then rake their opponent’s faces into the cage. The weapons focused beat down by Hotta and Kimura continues as Hotta gets a chain as well, Watanabe is bleeding everywhere as her partner Inoue begins to fight back. Inoue finally gets the upper hand on Hotta while Watanabe rams Kimura’s head into the cage, Watanabe tries to bail out of the ring but Kimura pulls her back to the apron. Inoue gets the board and hits Hotta with it (Inoue naturally is bleeding as well by now), Watanabe then does the same to Kimura until the board breaks. Hotta and Kimura get chains to take back over, Hotta then gets the ladder and props it up in the corner. Inoue tries to leave again and gets to the top of the cage, but Kimura joins her as they straddle the top and trade punches. Hotta drags Inoue back down, Kimura returns too but Watanabe recovers and both she and Inoue lariat Hotta in the corner. Kimura is next getting a series of lariats, double suplexes by Watanabe and Inoue and Watanabe hits a splash from the top rope. Inoue and Watanabe decide its time to leave and start climbing, but immediately are grabbed from behind and tosses back in the ring. Hotta starts throwing chairs at Inoue and Watanabe while Kimura wrapping them in chains, she then gets the ladder and slams it down onto them. Hotta and Kimura go to leave but Watanabe and Inoue quickly recover and stop them, Hotta gets a ladder and wraps a chain around it while the chains are still attached to Inoue and Watanabe, pulling them both to the mat. This gives Kimura time to escape, leaving Hotta alone with Watanabe and Inoue. Watanabe and Inoue immediately jump on Hotta and double team her, Watanabe and Inoue both go to escape the cage with Watanabe making it over. From the outside, Kimura prevents Inoue from getting over the top, which for the moment leaves Hotta and Inoue alone in the ring. Inoue and Hotta grab different ends of the chain, but end up hitting each other at the same time, leaving both on the mat. Inoue is up first but Hotta punches her in the face, Hotta goes to escape but Inoue joins her and suplexes Hotta down to the mat. It should be noted that at some point, someone has propped up a ladder leaving against the cage outside the ring, to make it easier for one of the two to climb out. Hotta throws a ladder at Inoue, Hotta starts to climb the ladder but Inoue pushes her backwards, with the ladder landing on Hotta. Hotta is out of commission from that so Kimura climbs back up to stop Inoue from escaping, Hotta miraculously recovers and suplexes Inoue to the mat. Hotta sets up a table near the corner and puts Inoue on it, Kimura is perched on the top of the cage and she dives back into the ring with a diving footstomp onto Inoue. Which doesn’t break the table so Inoue just rolls to the mat. Hotta goes to escape but Inoue already is back up and grabs her leg, Watanabe climbs the ladder from outside the ring to further block Hotta from escaping. Kimura has re-escaped in the meantime while Hotta pushes Inoue back down to the mat, Hotta climbs over the top of the cage and onto the ladder but Inoue grabs her from inside the ring before she can hit the floor. Hotta spits green mist at Inoue to get her to let go, and Hotta hits the floor! Yumiko Hotta and Mask de Sun are the winners. There are a lot of things to love about this event. First of all, it had a really good variety of matches as we had a comedy match, grumpy veterans match, singles matches, tag matches, and of course a bloody brawl. None of the matches were bad, some were average or ‘just there’ but nothing brought the show down. All the ‘legend’ wrestlers on the event brought everything they had, with Hotta and Yokota in particular really going all-out. The main event is the type of match you don’t really see in wrestling much anymore, as it was just a bloody violent cage match with crazy spots and memorable moments. Overall a really great show that I thoroughly enjoyed, highly recommended.